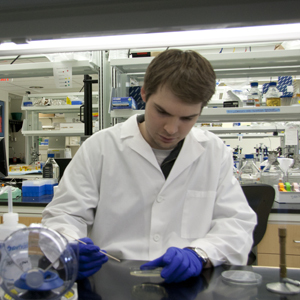 Graduate student Kevin Forsberg, shown preparing a bacterial culture, led a comparison of antibiotic resistance genes in soil bacteria and in pathogens. The researchers found identical genes for antibiotic resistance in soil bacteria and in pathogens from clinics around the world. The matches prove that the two groups of bacteria have recently shared these genes but do not establish the direction of the sharing. Using soil samples from sites in the United States, Dantas and his colleagues identified a series of antibiotic resistance genes in soil bacteria that can resist five classes of antibiotics, including forms of penicillin, sulfonamide and tetracycline. They found seven genes, of which several appear to be clustered together, that collectively employ all the known strategies for resisting antibiotics: blocking or ejecting the antibiotic from infected host cells, directly attacking the antibiotic or modifying the bacterial protein targeted by the antibiotic. The same antibiotic resistance genes were present, often in similarly clustered arrangements, in samples of disease-causing bacteria from medical clinics around the world. Many of the matched genes were identical not only in the sections of the genes that code for proteins but also in nearby non-coding sections. Bacterial DNA normally accumulates mutations and other alterations much more quickly than the DNA of humans. The lack of changes in the antibiotic resistance genes identified in the study suggests that the transfers of the genes must have occurred fairly recently in evolutionary history. Dantas’ presentation will also feature earlier research he conducted on the presence of antibiotic resistance genes in human gut microbes. The panel begins at 9:45 a.m. PT Monday, Feb. 20.